If you’re trying to get the best night’s sleep possible, the right mattress is an essential factor. With so many different options on the market, making a decision is somehow even more difficult! And for those with more specialist requirements, getting the correct mattress for your needs is even more essential. Put simply, choosing a mattress only becomes harder if you suffer from back problems. So what is the best mattress for a bad back? We’ve reviewed five of the most popular options to help find the top option for you. Not all bad backs are created equal, but by finding the best mattress for back pain you can make sure your pain is minimised and has less of an impact on your daily life. Whether you prefer a harder or firmer mattress, sleep on your back, stomach or side, or prefer innersprings or a foam construction, this list has an option for you. Here are five of the best mattresses for sore backs. The Casper mattress was one of the very first direct-to-consumer options, and it still holds up as a great memory foam option. If you favour the feeling of memory foam but suffer from pain in your back, this product could be a fantastic option for you. The mattress is constructed of four layers of premium foam for an extremely comfortable, soft but supportive feel. The top layer is breathable open-cell foam to help with cooling, the second layer is a high-density memory foam which gives pressure support and a contouring feel, the third layer is comfort transition foam to help with even weight distribution, and the bottom is the supportive base layer to give the mattress structure. Regarding back pain, the memory foam here is particularly beneficial for spinal alignment. It offers patented “Zoned Support,” which adjusts the pressure between the shoulders and the hips to keep the spine in a comfortable position. It helps to transfer the pressure from the shoulders to the core and the hips, providing pressure relief for the shoulders and therefore protecting the back. This mattress is well suited for sleepers of every position when it comes to back pain. Whether you sleep on your stomach, back, or side, it helps to balance the pressure across your body and keep the spine in a healthy position. This means it’s ideal for keeping the back comfortable overnight and preventing you from waking up feeling stiff. It is overall an excellent mattress for lower back pain. There are some drawbacks, however. Those who are of a heavier build can find the Casper gives too much sinkage and not enough support. If you suffer from back pain unrelated to spine alignment, then this one is unlikely to provide any more relief than other mattresses. Plus, if you find the contouring feel of memory foam uncomfortable and can feel “trapped” while sleeping, you may be best avoiding this model and opting for non-foam. This is down to personal preference. Purchasing the Casper mattress is extremely easy. You can order online, and it is delivered straight to your door in a compact box. Every mattress comes with a 100-night risk-free trial, so if you don’t like it, the company will pick up the mattress and refund you, no questions asked. Delivery and returns are always free, and the company is known to offer exceptional customer service options. The Casper comes in eight different sizes, from a Single to a Super King. This means you can enjoy regardless of your bed or room size. It also has a sleek, minimal look, and the zip-off cover means it’s easy to clean. Zoned support for pressure points. Good balance between sink and support. Poor edge support for those who sleep or sit on the edge of their bed. Maybe too soft for heavier sleepers. Potential for off-gassing immediately after purchase. 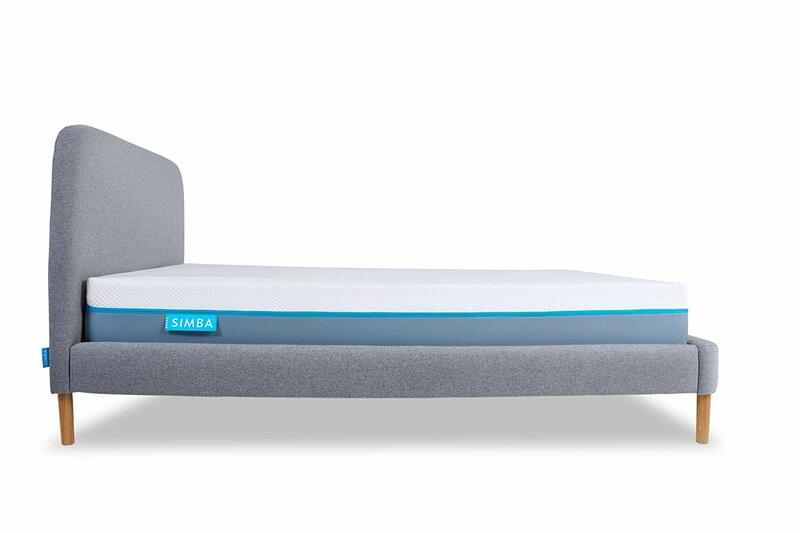 If you fear the Casper may be just too soft for you, or know you favour a firmer mattress, you may want to consider the Silentnight 7 Zone. This memory foam mattress offers patented 7-zone support, which means it provides different levels of support for different parts of the body. It softly holds the shoulders but provides a firmer and more stable surface for the hips and core, which helps align the spine and minimise potential back pain. This mattress has a Miratex core of high-density foam, which gives it a firmer feel with less sinkage and bounce. It also helps with pressure absorption, making it a great option if you share a bed with a restless sleeper. The 7 zones of the name refer to 7 different areas of support in the mattress. This helps give a more uniform and supportive feel, and makes this one of the best options in terms of a firm mattress for back pain. While this may make you think this one is a little bit hard and lacking in comfort, that isn’t the case. The core is firm, but there is a top comfort layer made of memory foam. This layer is very responsive and gives the sinkage needed for relief of the pressure points. It allows the weight-bearing parts of the body to be supported and cushioned from all angles. This mattress also has sturdier edge support than other foam based mattress options. The Silentnight 7 is better suited to back and stomach sleepers, because of its medium-firm feel. Side sleepers tend to need a little more sinkage in their mattress, as their shoulders and hips protrude further. But if you know you’re looking for a hard mattress for back pain, this could be a fantastic option for you. The main drawback is that it isn’t suitable for every sleeper. If you know you prefer a softer feeling mattress, you’re very unlikely to find this one comfortable. If you consistently sleep on your side, the mattress could potentially hold your spine in a somewhat uncomfortable position and actually cause further back problems. The Silentnight 7 comes with a luxuriously soft knitted cover to add to the comfort. It’s also allergy tested and approved, making it ideal for you if you suffer from asthma, eczema or other sensitivities. The zoned mattress has a 20 cm depth, adding to the feeling of luxury. It comes in seven different sizes, ranging from a Single to a Super King size. Delivery of this mattress is easy. It comes vacuum sealed and rolled in a box, so can be shipped directly to your door. The company also offers a five-year warranty on their product. Excellent option for a firmer, supportive mattress. Memory foam top layer adds comfort. Good edge support and minimal motion transfer. Can retain too much heat for those who sleep hot. The potential for unpleasant initial off-gassing. The Dormeo Memory Plus has an overall softer feel than other options on our list. This makes it the best mattress for side sleepers with lower back pain. Side sleepers have more protruding pressure points – if you sleep on your side, your shoulders and hips stick out much more than on your back or stomach. This means that your shoulders and hips bear the brunt you’re your body weight, which can cause pain. If your shoulders and hips aren’t adequately supported, this can also mean your spine isn’t correctly aligned. The Dormeo consists of two different foam layers. There is a core layer of Ecocell foam, which provides the mattress with structure and the base layer of support required. On top of this is the memory foam layer, which is what provides to contouring and pressure relief. Here, the memory foam layer is 50% thicker than in other options (3 cm to be exact). This means the Dormeo has a softer feel and offers more sinkage for pressure zones. On top of being a fantastic option for side sleepers who suffer from back pain, this thicker layer of memory foam has other benefits. If you know you prefer the feel of a softer mattress with more give, this one is an excellent choice for you. Memory foam offers other benefits to a mattress, too. This includes minimising motion transfer, which is perfect for those who share their bed and don’t want to disturb (or be disturbed by) their partner. The Ecocell base layer of this mattress is important, too. It offers superior air circulation to help keep the mattress at a comfortable temperature. In spite of it being of a firm structure, it still offers additional pressure relief on top of the memory foam comfort layer. The mattress has a carbon fibre enriched cover, which helps minimise dust within the mattress through anti-static. The entire mattress has anti-bacterial and anti-fungal properties and has anti-dust mite protection, too. There are a few drawbacks to this mattress, however. For one, it’s a slightly simpler construction when compared to other mattresses in our list. Whilst the two layers it’s built of are both high-quality and well-thought-through, it does still consist of only two basic layers. The mattress can also pose problems for those who don’t sleep on their side. For back or stomach sleepers, there’s a good chance this mattress will offer too much sinkage. This can cause the spine to be inadequately supportive and contribute to further back pain or spinal issues. You can purchase this mattress in five sizes, from Single to Super King. It ships vacuum packed, and delivery is easy and free. The company also offers a 60-night comfort trial to allow you to get a proper feel for the mattress. An ideal choice if you sleep predominantly on your side. Great for you if you have allergies or sensitive skin. Memory foam minimises motion transfer. Will likely be too soft for back or stomach sleepers. The potential for heat retention. The Silentnight Stratus Premier uses pocketed springs (rather than a foam) to create the structure and support of the mattress. This gives it a more durable, hardwearing base. Innerspring mattresses are known for offering more firmness, support and bounce back than their foam counterparts. 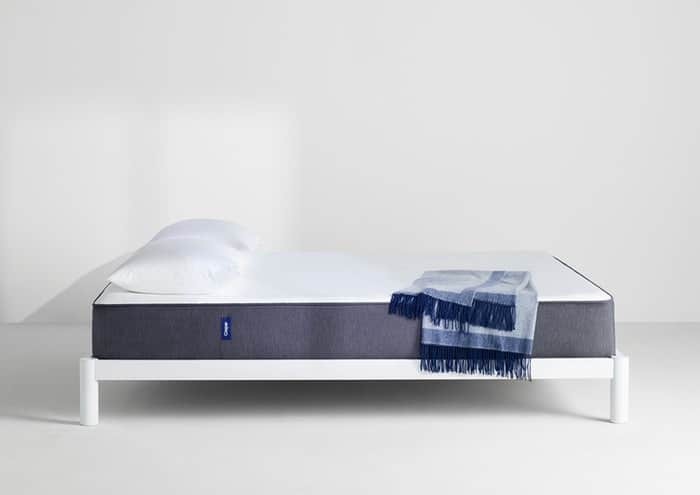 This mattress uses 1850 individual springs to create an even and supportive base. This gives the mattress an extremely comfortable, uniform feel. Each spring responds individually to the pressure of the body, evenly distributing weight and providing fantastic support. On top of these springs is a comfort layer made of silk and filled with cashmere and lamb’s wool. 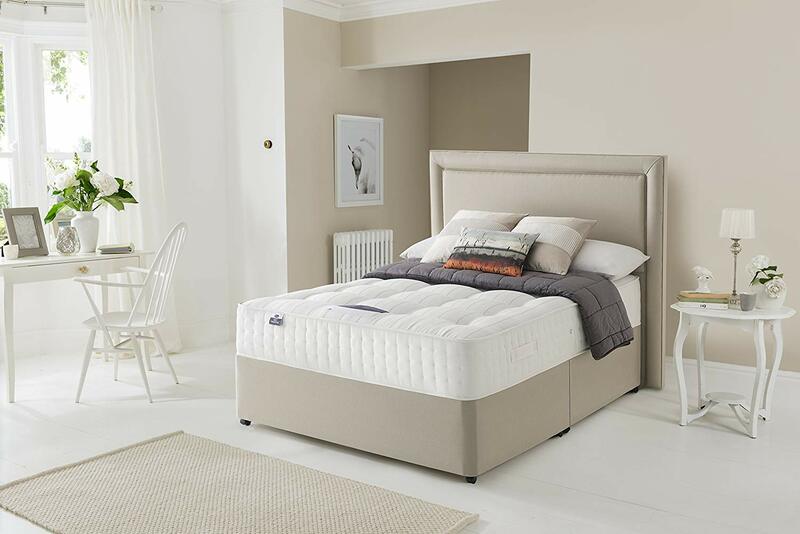 This gives it a pillowy, soft touch, and minimises the potential for feeling the springs through the mattress. The mattress is a more “traditional” feeling mattress than the other options on this list. The mattress is particularly well suited to back sleepers. If you sleep on your back, you have less protruding pressure points on your body. Therefore, a uniform, springy and even support will be the best way to mitigate any back pain. This mattress is also a fantastic choice if you don’t like the feeling of memory foam. This is a foam-free product, and all the spring and support comes from the individually pocketed springs. The mattress therefore also does away with other issues related to memory foam – primarily heat retention and off-gassing. If you tend to sleep hot or have an extremely sensitive nose, this could mean this one is the best mattress for you. Nonetheless, this particular mattress is not for everyone. It’s unlikely to offer enough contouring or pressure relief for those who sleep on their side. The springs can also cause issues with motion transfer, as springs give the mattress more bounce and less sinkage. This mattress comes with anti-allergy treatments and a hand tufted cover. Unlike the foam options on our lift, this mattress is two-sided, and therefore can be flipped. It comes with handles to help with moving and flipping. The Silentnight comes in four sizes, from Single to Super King. Because of its pocket sprung construction, it cannot be vacuum packed or rolled, and therefore delivery can be slightly trickier. This mattress comes with a 5-year warranty. Ideal if you dislike the feeling or features of a memory foam mattress. Offers uniform support and a comfortable top layer. Perfect if you predominantly sleep on your back. May not offer enough contouring for side sleepers. Pocket springs can mean more motion transfer. Can’t be vacuum packed for easy transport and delivery. The Simba Hybrid mattress combines both pocketed springs and memory foam to create a product that’s the best of both worlds. 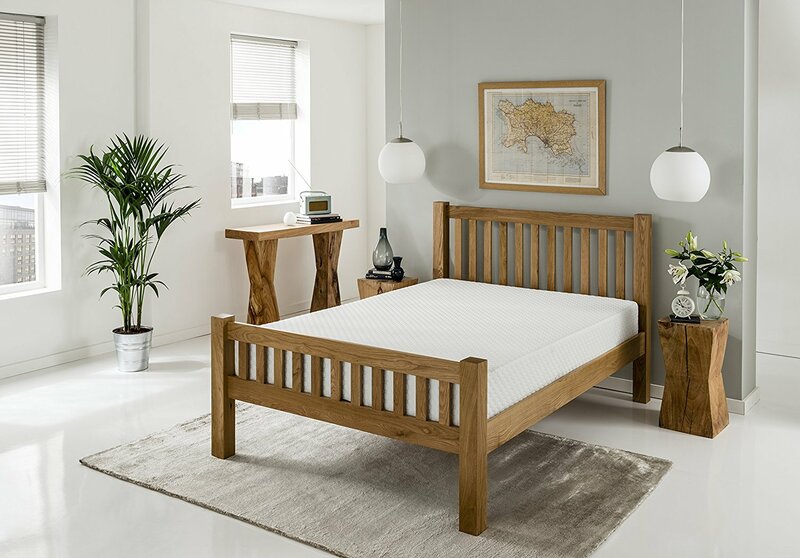 The pocketed springs provide the supportive core of the mattress, while the memory foam top layer offers the sinkage and contouring. The mattress consists of five layers. The top layer is a hypoallergenic cover to give a soft surface and offer temperature control. The second layer is called Simbatex, and provides cooling and gentle support. Underneath this is the third layer of 2,500 unique conical pocket springs. The fourth layer is supportive, contouring, viscoelastic memory foam. The base foam layer has 7 different pressure zones to offer maximum support. The hybrid nature of the mattress means it can be well-suited to those of any sleeping position. The combination of the springs and foam offers custom support, so it provides enough sinkage for side sleepers and enough firmness for back and stomach sleepers. Having a hybrid spring and foam design also helps with mitigating the problems of either type of mattress individually. This mattress offers the bounciness of springs but with the motion transfer minimisation of memory foam. It also provides the contouring and comfort of memory foam without the common issues of overheating and feeling trapped in the mattress. There are some slight drawbacks to the Simba. Because it’s designed to be well suited for the vast majority of sleepers, it could end up being unsuitable for people with extremely specialised needs. Furthermore, by combining both foam and springs, this mattress can face the issues associated with both. However, it is so cleverly designed as to avoid these issues predominantly. The mattress comes in an impressive twelve sizes, from Small Single to Emperor Size and including EU size options. There’s free delivery in a vacuum-packed box and a 100-night risk-free trial period. The mattress also comes with a 10-year warranty. Well suited for the vast majority of sleepers. Provides the “best of both worlds” in terms of springs and foam. Excellent free trial, warranty, and size range. Not well suited to those with extremely specialised needs. Can have issues with heat retention associated with foam. Could be potentially slightly too firm for some. There are a few separate things to consider when trying to find the best mattress for bad back. As you can imagine, there are numerous variables involved when it comes to choosing anything to deal with aches and pains. Most importantly, you’ll want to consider the best type of mattress for your back pain. Additionally, you’ll need to consider the type of back pain you’re suffering with, and the main position you sleep in. Below we discuss in further detail some of the main characteristics and properties you need to be aware of when making the right choice. There are two main mattress “types” in terms of construction. These are innerspring mattresses and foam mattresses. Innerspring is made of coiled pieces of metal, which are contained in soft fibrous material to provide support and bounce. Foam mattresses are made of different types of foam, usually in a few different layers. There are also hybrid mattress options. These combine a layer of innersprings (usually individually pocketed coils) and layers of different types of foam. Innerspring mattresses tend to be firmer, bouncier and springier. Foam mattresses tend to be softer, and have more sinkage and contouring. Depending on the type of back pain you experience (plus other factors) you can judge which is likely to be more suitable for you. Innerspring mattresses tend to be a better choice for those who sleep on their backs or stomachs, as they give a firmer, less sinking surface. Foam options are better for side sleepers, as they give more contouring to the protruding pressure points of the hips and shoulders. Generally speaking, softer mattresses are better for side sleepers, while firmer mattresses are best for back or stomach sleepers. It’s also worth considering your bedframe when looking to purchase the best bed for bad back. For example, if you have a soft mattress and sleep on your side, a slatted frame could end up being felt through the mattress. Combining the perfect mattress and frame is key to relieving back pain. This article is designed to help those who suffer from mild to moderate back pain as a result of poor mattress support. If you’re suffering with more severe back pain talk to your doctor about whether an orthopaedic mattress for back pain could help. If you’re suffering from sciatica or a similar condition, you may wish to consider researching the best mattress for sciatica in the UK rather than totally relying on this list. Our winning choice for the “best mattress for bad back” category has to be the Casper mattress. It offers the most universally comfortable options to suit the majority of sleepers and help with your bad back. It also offers great value for money, easy delivery, a fantastic warranty and an enormous range of sizes. For the vast majority of sleepers with back issues, this mattress will offer fantastic comfort and support, while helping minimise pain. Back pain can be a hugely personal problem, so recommending just one across all sleepers can be problematic. If you feel your sleeping position and personal preferences better fit another mattress from our list, then that is likely the better choice for you. Nonetheless, regarding the best all-round mattress for back problems, we think the Casper mattress best fits the bill.